Crafted for fit. Styled for support. The award winning Panache Sport is the ultimate sports bra, delivering maximum support, comfort and stability, enabling women of all sizes to take part in any sport at any level. 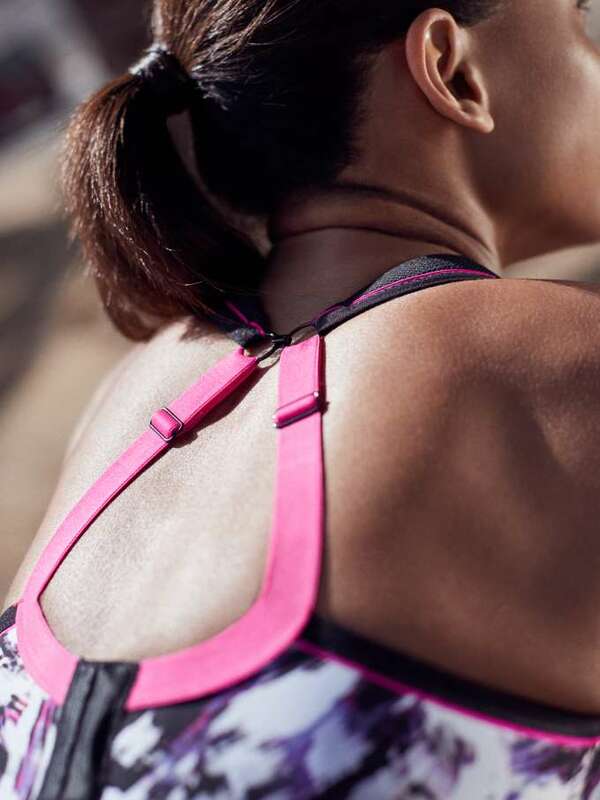 Panache Sport was developed and tested using the latest 3D motion and biomechanical technology from Progressive Sports at Loughborough University. By encapsulating the breasts rather than simply strapping them down, Panache Sport comfortably reduces ‘bounce’ by an amazing 83%, whilst fitting and feeling like a normal bra. It is Panache Sports aim to show that all women have it within them to achieve their goals, whether it’s taking that first step into the gym or running a marathon. Model wears Wired Sport Bra in Painterly. Model wears Non Wired Sport Bra in Purple Pink. Model wears Non Wired Sport Bra in Black. The award winning Panache Sport collection takes a fun, vibrant theme with edgy accents and prints, perfect for a sporty, fashion forward look inspired by the nostalgia of the 80’s and 90’s. This season the “Painterly” print is a great example of the 90’s comeback, just what any gym kit needs!